Our 3-Letter Vine Monogram is probably our most popular item! This is the perfect gift for every occasion! Please look closely at the ordering instructions to ensure you get exactly what you are wanting. This wood monogram wall decor comes unfinished. 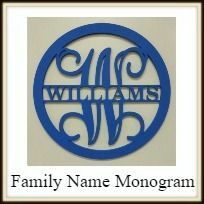 All personalized monogram wall decor ship within 2 - 7 Business Days. Our monogram wall decor ideas are crafted of a high quality cabinet grade MDF. All diy monogram wall decor are cut in-house on our CNC routers and are hand-sanded, smooth to the touch. We recommend using an acrylic paint on our unfinished custom monogram wall decor. These paints can be bought at Wal-Mart, Home Depot, Hobby Lobby and other stores. A keyhole mount is provided for items 12" and larger. We recommend command strips for smaller monogram initial wall decor. All large monogram wall decor cut on 1/4" MDF are weather resistent and suitable for outdoors. We love taking custom orders! Any sign or logo can be custom made for your business or home. Call 1-855-992-7677 or email support@Build-A-Cross.com for more information! This is my very first order from your company and I am totally impressed. The quality of the products I ordered were over my expectations. One item is for a wedding gift and I can't wait to deliver it. My order was placed on a Friday and received on a Wednesday. Super fast and the packaging was above and beyond to protect the merchandise! Will be a future shopper for sure! So pleased with all out Christmas gifts. We did initials for all the girl cousins. They were quick and shipped so carefully packed. Would totally recommend their products!!!!! The quality of my monogram wall hanging is outstanding! I have ordered many products and they have all been amazing. I loved how the 3 letter wall art turned out. It arrived faster than expected and it was exactly what I wanted. I have done business with these kind people before and have never been disappointed. Thank you for being so fast in shipping and handling. I will be back. It was exactly what I wanted and came so quickly. This site is very service-oriented and very quick in filling orders. The quality is great for painting the Monograms I order and everyone LOVES these gifts I make. They are very quick to respond to any questions that you have regarding a product or order.